In October last year we asked you to take part in the Open Data Challenge. 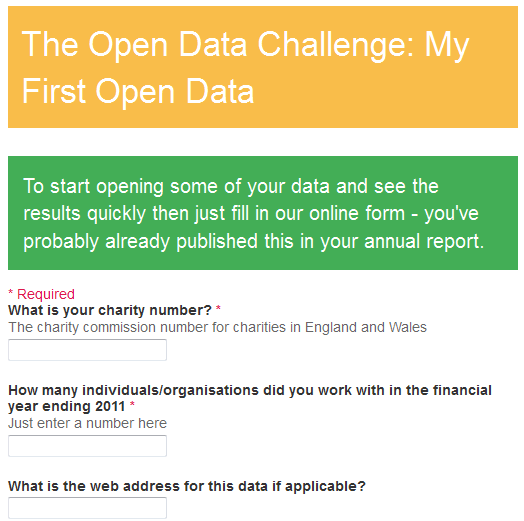 The challenge was created for Lasa’s Open Data event in September and all we wanted was as many organisations as possible fill in a simple web form with their charity number and how many ‘people’ (or organisations) they had worked with in the last financial year. The challenge was a simplified exercise to illustrate what could be done with a very small amount of opened data, but it also contained a very serious point about data. Can you access the number of people you worked with last year, at the touch of a button? By that, I don’t mean can you ask a staff member to spend an hour or more collating forms, adding them to a spreadsheet and then summing the total number of people. I mean can you (or your manager) go somewhere – either on your computer or online – press one or two buttons and get the number of beneficiaries, within, say 5 minutes max? It’s a serious question. If you can’t easily find out how many people you worked with, how will you know how much time you spent working with them? How can you know how much your support is costing in order to bid for contracts? That is all before you even start to talk about evidencing the difference your work is making. The Stanford Social Innovation Review wrote a blog post on the ‘Ten Technology Trends to Watch in 2013’. It was interesting that 3 of the 10 involved data. Firstly around measurement ‘what doesn’t get measured doesn’t get improved‘, secondly around ‘deploying data to answer burning questions’ and lastly the development of ‘knowledge hubs‘, stores for non-profit data, to open up to others for analysis, comparison and sharing. Despite being a US centred post these are all definitely areas that are starting to develop in the UK charity sector and we’ll see even more of them this year, particularly as funding for the sector faces further cuts and organisations will need to demonstrate the impact they are having in order to compete. All of these trends assume that you can already easily access your data in a usable format. If you’re feeling bamboozled by the 2013 trends then take a step back and think about that first question. How easy is it for you to find out how many people you worked with last year? Take a few minutes and give it a go.